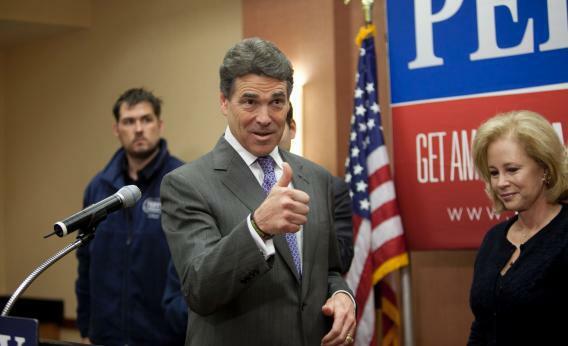 Rick Perry, Victim of the "Drive-By Shooting from the Liberal Press"
NORTH CHARLESTON, S.C. – Everybody loves a wake. Minutes after the Perry campaign announced an event at a Hyatt off the highway here, reporters rushed in, earning the right to stand in line and maybe get into the room he’d rented. The one-time frontrunner for the Republican nomination would speak in a tiny space, overstuffed and overheated, decorated by two flags that had been delicately placed by aides. I tried to plug in my computer. “Not there!” said an overtaxed Perry aide, working the mult box for cameras. “I lose that, and everything goes down.” I found a space close by, occasionally gritting my teeth as he warned other reporters not to mess up a delicate set-up, and as he talked down late arrivers who learned that they wouldn’t have good sound. Perry was only a few minutes late, flanked by his son Griffin and his wife Anita. He kept his remarks to 11 minutes, and got to the point quickly: He was out, endorsing Newt Gingrich. Ah, but Perry and debates – there’s an automatic wince when those words appear close together. Katon Dawson, the former South Carolina GOP chairman who walked the state with Perry, told me that future campaigns would learn to “say yes and say no” to debates. “We were victims of a drive-by shooting by the liberal press,” he said. At the same time, Dawson was suggesting that Perry’s move would boost Gingrich’s fundraising. “The governor raised $18 million in forty days!” he reminded me. We’d almost forgotten: Perry was the candidate who’d command big conservative, Texas fundraisers and turn their guns on Mitt Romney. Those fundraisers had wasted their ammo. And now they were free.